Two Waffle House employees in Memphis, Tennessee, went viral this week after footage was posted on Facebook Sunday showing them in a vicious fight about washing dishes. The video, which was filmed and shared on social media by Eric Cole, shows the two unidentified employees briefly exchanging words before one staffer decides to smack the other on the back of her head. Within seconds, fists go flying and hair quickly gets snatched. "I ain't letting this b*tch go, hell no!" the alleged victim yells out at shocked staffers trying to pull the pair apart. Although they were eventually separated, it wasn't because she willingly let go: it was because she pulled out her attacker's hair extensions. According to Memphis news station FOX 13, the fight, which took place at roughly 7 a.m. local time, began after one employee asked another, who wasn't on the clock yet, to start washing dishes. Officers from the Memphis Police Department responded to the scene after receiving reports of the incident. It's unclear if charges have been filed in the matter. Waffle House acknowledged the incident to the Memphis station, saying, "The manager handled the situation immediately." 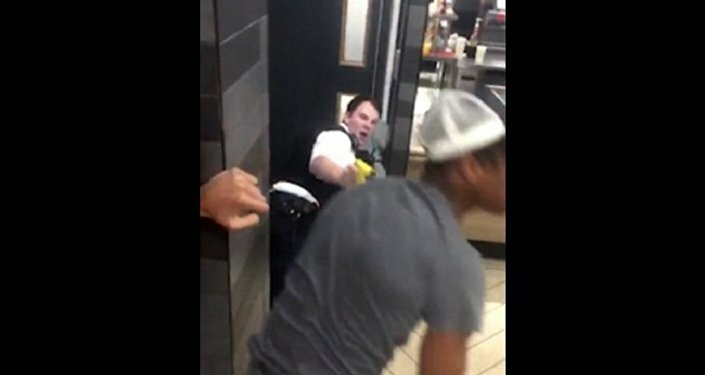 The latest viral scuffle comes after several brawls were recently recorded inside McDonald's locations in the US and the UK.